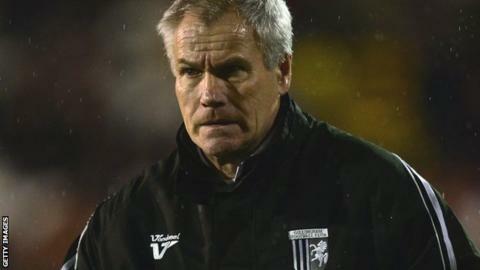 Peter Taylor has revealed he has not spoken to Gillingham chairman Paul Scally since being sacked as manager on 31 December. The 62-year-old was dismissed following a phone conversation with Scally. "I did email him as I did say something to him that a manager shouldn't say to a chairman, even though I was annoyed," Taylor told BBC Radio Kent. "I do regret [what I said] but that is how it goes. We have all got our pride and a little bit of a temper." Gillingham were one place and two points above the League One relegation zone when Taylor was dismissed, 14 months into his second spell managing the Kent club. At the time Scally told BBC Radio Kent he "hadn't intended to sack" Taylor but that the phone call with the one-time England boss had prompted him to act. "He called me and as a result of that conversation I had nowhere to go and wasn't prepared to let him carry on with the team," said Scally. Following over a month with a four-man caretaker team, Gillingham appointed Justin Edinburgh as boss in February and went on to finish 12th in the table. Taylor says he is "pleased" with how the club have done since his departure from Priestfield Stadium. "Justin has gone there and done well and the players have shown what I thought they could do," he said. "They have shown, with a bit of confidence and consistency, that they are a decent team. "Unfortunately I wasn't a part of it but I'm really pleased they got safe quickly and played with a bit of style." Taylor has been scouting for Wolves since his sacking, but he is set to return to management with Indian Super League side Kerala Blasters later this year. "David James was the manager last year and then all of a sudden I got a phone call," he said. "It is very different but it is four months and it is very exciting. "It is incredibly well supported and the quality of the football is good. Once I am out there it will go fairly quickly." Did Suarez & Bale define title race? Read more on Did Luis Suarez and Gareth Bale define Spanish title race?